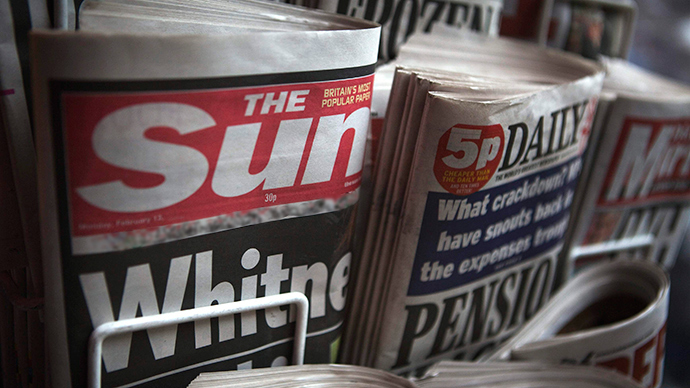 The “two faced” Sun newspaper has been slammed for openly endorsing rival parties in two of its editions. The UK edition urges the public to vote Tory, while the Scottish edition calls for the public to back the Scottish National Party (SNP). The titles owned by Rupert Murdoch have released their pre-election verdicts just seven days ahead of polling day. In the lead up to May 7, the Sun has published a slew of pro-Tory and anti-Labour stories, encouraging its readers to back Prime Minister David Cameron. The right-wing paper, which is at the heart Murdoch’s empire, has a long history of seeking to influence elections. It appears the paper is resurrecting the tradition, but using a less blatant strategy to demolish Murdoch’s least desired party and keep Ed Miliband out of Downing Street. Miliband found himself in Murdoch’s crosshairs after Labour pledged to “take steps to protect the principle of media plurality, so that no media outlet can get too big” and disproportionately influence voters, according to the New Statesman. The Sun’s UK edition, published on Thursday, urged the public to vote Tory. The headline read “It’s a Tory,” over an image depicting Cameron as a baby cradled in Kate Middleton's arms, suggesting a Tory government will be reborn. The “contradictory” Scottish edition encouraged Scottish voters to back the SNP. Under the headline “Stur Wars,” a play on Nickola Sturgeon, is a mockup of the SNP leader as Star Wars heroine Princess Leia. The covers were released shortly after an Ipsos Mori poll showed the SNP could potentially win every one of Scotland’s 59 seats, obliterating the Labour Party in its traditional heartland. “Downtown tabloid the Sun endorsing the SNP in Scotland, but backing Tories in England to ‘stop SNP running the country’.Nope, us neither,” Record staff tweeted. So @rupertmurdoch orders Sun readers in England to vote Tory to beat the SNP, and orders Sun readers in Scotland to vote for the SNP! "The narrative published through his publications is that a Conservative victory is the best for the people,” he added. Nicoll denied a deliberate anti-Labour strategy. “Sometimes that support has gone the way the vote has gone, sometimes it hasn’t. The people of Scotland seem to have chosen the SNP, and we’re going with them,” he added.